Born in Finland, Tarja Turunen is a lyric soprano who began her career as lead singer for the symphonic metal rock group “Nightwish,” which she co-founded with a fellow music student. She went solo after a nine-year collaboration with the group, developing a successful international career with four albums and various collaborations with artists in Europe and Latin America where she is now based alongside her Argentinean husband and daughter. My sweet girl was a baby not long ago and enjoyed watching My Little Pony cartoons on cable and later on YouTube, where a fan video depicted pictures of Ponyville characters using a haunting rock song as background music, that the fan announced to be Finland’s “Nightwish”. My tween girl was hooked and as she grew out of ponies, she grew into Tarja Turunen’s powerful three-octave voice, long dark hair and green eyes. Chile’s no different from Toronto where concerts are concerned: you buy your tickets on-line and print a bar-coded copy to be presented at the gate. It was a weekday and we met with Muriel at her apartment downtown where I parked the car. The theatre, according to the map of that area of Santiago I had printed beforehand, was 10 blocks away, so we walked through inner-city shops and tenement buildings, Muriel leading, my daughter immediately after while I held the rear. A block away we were intercepted by scavengers – illegal immigrants from neighboring Peru, Ecuador or Colombia, by their accents, peddlers and souvenir merchants selling posters, head and wrist bands, T-shirts, etc. Upon entering El Teatro Caupolicán, an old building that reminded me of Massey Hall in architectural style and years, we were padded down by a female guard and Muriel’s lighter was confiscated. “Your mother slipped half a pack of beers into a New Year’s party once by shoving them in her socks; then she went to get padded down by the male guard who was too taken aback to do a thorough job.” My daughter laughed at Muriel’s colourful anecdote and I took note never to invite her to a mother/daughter thing ever again! 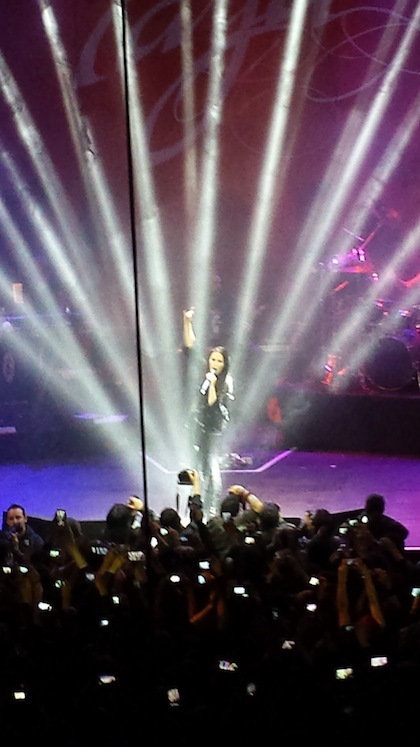 We sat and waited for the theatre to fill up, watching the impatient front-line fans call out “Tarja, Tarja!” and “diosa, diosa” (“goddess, goddess”, in Spanish), and my mind wandered to the past. My first rock concert was in Chile, at age 30, after living in Canada as a second-generation immigrant for 20 years. The band was the Canadian group “Toto”. I knew Toto’s songs from the radio and friends’ records. My best friends’ boyfriend had been a stagehand and percussionist, telling us many colourful groupie stories and of his on-the-road adventures. But I had never been to one of their concerts, or to anyone else’s for that matter. Oh, sure, I had been to classical concerts at Roy Thomson Hall, small recitals in art cafés and musicals at the O’Keefe (now the Sony Centre) where in my salaried years I joined my parents as patron of the opera season one year and the ballet season another. In fact, my favourite musical memory was sitting front-row-centre at Roy Thomson’s, awestruck at Ms. Leontyne Price’s Liebestod, tears pouring down my cheeks and pooling at the deep cleavage of a very red dress that distracted the string section but gave me what I wanted: for Ms. Price to see me breathe out a Thank You as she glided off the stage, like a Wagnerian mythical creature, floating upon a cloud of thunderous applause. In poorer university student days I enjoyed the WOMAD festivals (World of Music, Arts and Dance) on the waterfront and summer concerts at The Forum at Ontario Place (now the Molson Amphitheatre), where I saw, among others, the Gypsy Kings, Bruce Cockburn, The Canadian Ballet, The Manhattan Connection (now I’m really dating myself) and Ella Fitzgerald…timeless Ella, her aged outer shell housing an immortal voice that sang decades of memories, about those she had met and things she had done and seen. Before that, still in high school, together with my friends Mariela and Felipe, we had sought our cultural roots. This included practicing our native tongue, its Chilean slang, customs and its music. Mariela and I learned to strum the guitar and so practiced folk songs of fishermen yearning for loved ones to knit warm woolen hats in time for winter. Mariela met other Chilean teenagers and young adults, immigrants and exiles, who spoke of continued repression and chaos. They disliked our fishermen songs and urged us to play and sing songs of Amanda and her lover Manuel who died as an exploited laborer in the mountains. My mother later said she would sit in a dark corner in the stairs to listen to us practice these and other songs by Victor Jara, wondering how much we knew of this torture and murder five days after the September 11, 1973 military coup that ended Salvador Allende’s presidency. I did not attend rock concerts in Canada because my parents feared for my safety amongst what they called the brainless masses. “Lemmings,” said my father, “people in masses behave like lemmings”. We did not attend massive concerts, New Year’s Eve firework displays, or rallies of any kind. Parades were ok, if authorized, although we always left before the crowd dispersed, missing Santa every time. This fear of theirs spawned from the years prior to and immediately following the Chilean 1973 coup, as chaos and violence fell upon street protests. You must keep in mind that the Chilean military coup is historically viewed as one of the most violent in its level of organized repression on all levels of society. My mother who was a nurse commented how the chief of medical staff was replaced within days by a colonel. My father had attended concerts in the 60s and political rallies in the 70s. As a teenager my mother had once been hosed down while attempting to climb a street barricade to reach her favourite bolero singer, happy to walk home drenched from head to toe after getting a glimpse of Lucho Gatica waving at her from his car. But the crackdown after the coup had been deadly and strict curfews and violent repression restricted even the smallest of gatherings. As immigrants fleeing such horrors in search of a safe future for their children, any mass gathering was as much a grim reminder as a potential danger. And so it was that at nearly 30 years of age, only months after arriving at a newly democratized Chile, I attended a Toto concert so far from the haven my parents had sought… and I loved it! I loved feeling the rhythm competing for space on my chest and legs, the heat from those around me, the loss of individualism to become one with a single-minded mass moving to the sounds of performers filling your senses with sights and sounds. Just like Ms. Ella, Leontyne Price and Yul Brynner, these rock performers sought our joy at what they did, how they sounded and played; they sought our appreciation. We were part of making this one person feel bigger, expanding over the mass and wash over us as we the mass rocked back to them as well. Years later my daughter can feel that too, with her mother by her side looking after her and watching and anticipating the mood from the crowd. She will read of her grandparents’ nightmares in history books and ask whether I remembered some of it first-hand. I will relate some horror stories, respecting her age and promising to tell more in future. But in the meantime, I let her soak in the theatre and wait. Although my baby dressed in her Tarja black tee and added black eyeliner, other fans ranged from conservative garb to more extravagant gothic items; one girl was dressed in Japanese cosplay. My daughter’s comment was, “wow, she did a really god job looking like Hatsune Miku or Misa-Misa!” I had to Google that one. The age of the fans ranged from my daughter to people older than me, some were couples and some were LGBT. “Tarja seems to appeal to a wide range of fans,” I commented to Muriel, who was already on her second beer and flagging the stands vendor for more. A whiff of marijuana smoke reached us and I turned to my daughter who waited for me to make a comment: “you know what that is?” – “You’re gonna tell me it’s marijuana, right?” – “Right,” I answered and added, “if it gets to be too much, or if the beer drinking around us makes people rowdy, we’ll move.” However, as the music started and the light shone all around, everyone hooted and clapped, but kept to their seats. Muriel was the noisiest fan, yelling accolades, requesting encores, whistling and waving her arms to the rhythm of the drums: “They sing for you and in return they want to feel your energy”. I could see how my baby enjoyed her first rock concert. 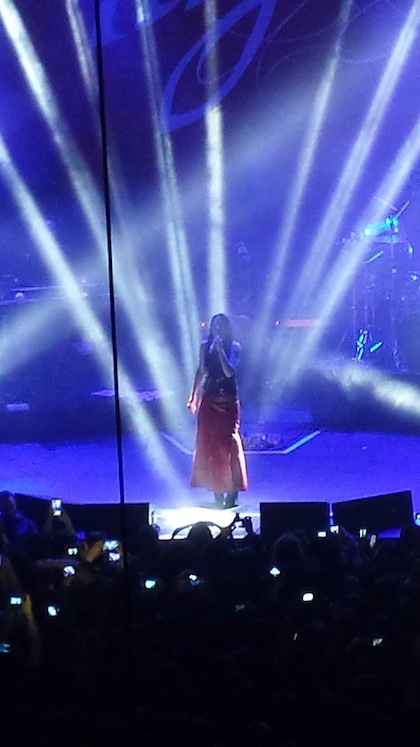 She liked the feel of the music on her chest and legs, the play of lights and the connection with the singer as she sang in unison with Tarja. “Did you like it, mom?” she asked as we walked home, the dark streets vibrating under our feet. “Yes, baby,” I said as Muriel steered us away from a darkened doorway where a drug transaction was taking place, “I liked it very much. Let’s do that again”. We walked hand in hand through one of Santiago’s main avenues and she asked whether I’d captured good pictures and videos: “Send them to my WhatsApp account, mom, to show my friends at school tomorrow!” Happy to comply and happy to have shared this one “first” among many, we reached our car and drove home, exhausted but in peace.